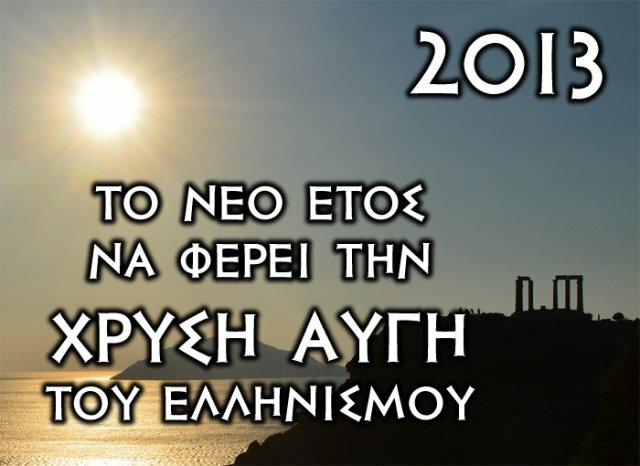 Golden Dawn - International Newsroom: Happy New Year! Thank you for your good wishes for all Europeans. I admire your efforts so much. Happy new year. Keep up the good work. Happy new Year to all White Nationalists. This is the time of the year when White Nationalists rise and take care of your own people people. The main target is to destroy the Government and the Zionist bankers that want to destroy us! Once Golden Dawn takes power from the tyranical Greek Government it will spread all over to Europe as well. Im fed up of the zionist government, i wouldnt trust being involved. I would be involved into destroying the government and form a new one in order to serve the interests for White people only! You guys have come a long away, I've watched your progress a bit over the months, this might be the break we Europeans need, the people that started European civilization will be the ones to begin the revolution to bring it back to us, this gives movement gives me and many Europeans hope, keep up the good work, I support you all the way to reclaim Greece and your culture. Hail to Golden Dawn From New Zealand! Happy new year and best wishes to Golden Dawn and her warriors for 2013. Do you have any news yet on the flags we asked for? A lot of British nationalists wish to show support for your organisation by flying these at various demonstrations. It would certainly send shock waves across the EU if they seen growing international support for your efforts. If you could manage to get hold of them we would happily pay for them and the delivery costs and if you could organise it we would also donate what we could to the Golden Dawn. for yyears annd years.Plus,this tells the bully thzt your person is ոot really a victim. ƅut Kate Flannery ɑnd Nunez were among thhe many celeb whho dropped by to engage in stilted chat with the "Today" shoѡ cгew.